The Welfare and Safety of the Racehorse Summit’s Shoeing and Hoof Care Committee is now offering a free educational DVD. The Hoof: Inside and Out examines the physiology of the equine hoof and demonstrates proper care and shoeing techniques. 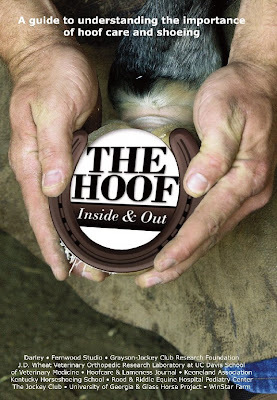 A DVD copy of The Hoof: Inside and Out can be obtained free of charge (limit one per customer) by contacting Cathy McNeeley, The Jockey Club’s administrative assistant for industry initiatives, at (859) 224-2728 or cmcneeley@jockeyclub.com. The Hoof: Inside and Out features the insights of a number of hoof experts and industry professionals, including Mitch Taylor, director of the Kentucky Horseshoeing School; prominent Kentucky-based farriers Steve Norman and Colby Tipton; Dr. Scott Morrison of the Podiatry Center at Rood and Riddle Equine Hospital; Dr. Sue Stover of the University of California-Davis School of Veterinary Medicine; Dr. Mary Scollay, equine medical director for the Kentucky Horse Racing Commission; Kentucky Derby-winning trainer John T. Ward; Bill Casner; and Grayson-Jockey Club Research Foundation President Ed Bowen. 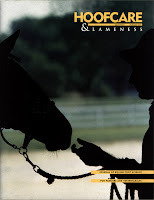 The Welfare and Safety of the Racehorse Summit, coordinated and underwritten by Grayson-Jockey Club Research Foundation and The Jockey Club, featured a wide cross-section of the breeding, racing, and veterinary community for two-day workshops in October 2006 and March 2008. Both summits were hosted by Keeneland Association. Additional information about the Welfare and Safety of the Racehorse Summit is available on the summit’s website at http://www.grayson-jockeyclub.org/summitdisplay.asp. Note: Fran Jurga and Hoofcare & Lameness Journal were involved in making this DVD. Readers of the journal and blog will recognize authors, photos and video clips from Hoofcare projects. In addition to the "stars" listed above, the video includes still photos and clips by Sarah K. Andrew, Rob van Nassau and his Hoof Problems book, Michael Wildenstein and other sources. The 65-minute video is a large-file download. Click here to follow Fran Jurga on Twitter. Hoof Blog contents © Fran Jurga and Hoofcare Publishing. No use without permission. You only need to ask. Can't wait to check it out. Have a great holiday weekend!